Leprechaun slots and Irish-themed slots have their ups and downs. So what about when hills are involved, surely that’s up and down. These games can be fun, but they’re in abundance and can feel re-done. Plus there’s nothing worse than seeing a grinning Leprechaun when you’re losing money, or listening to jolly music when the reels are not turning in your favour. So when I heard that the new Leprechaun Hills Slot from Quickspin was making mischief in UK casino sites, I went looking for the pot of gold myself. Did I find it? A good Leprechaun Slot has it all, every Irish mythical cliché you can think of. It’s also a good marketing technique for the gaming companies and online casinos to use. If someone says Leprechaun, we players think lucky and magical. Leprechaun Hills by Quickspin has the potential to be rewarding, it’s quirky, fun to play and there’s lots of pay lines, 40 in total. Add in the colour, music that makes you want to skip and two bonus features, all that’s needed is our money! When I play slots for real money to win real money, Leprechaun slots and Irish-themed slots are not my first choice. But Leprechaun Hills wins me over with its lucky re-spin bonus (more on this later). The people at Quickspin are hoping that the luck of the Irish rubs off on UK slots players following their latest release. But let us remind them that this luck is spread thin across hundreds of other Leprechaun slot games. And at 96.49% pay out rate we’ve seen higher. But at 40p a spin, there’s a 1000 x betting stake jackpot that still gives our Leprechaun its due. Quickspin slots are up and coming, no doubt. Yet there are betting looking slots out there in 2017. That said, Quickspin Leprechaun Hills runs rings around other Leprechaun slots and Irish-themed slots in the looks department. Graphics look crisp, I liked the detail of the Irish symbols and even the games background is well detailed. If you’re playing the Leprechaun Hills Mobile Slot its better again. Using the controls is simple, betting stake options from 40p to £80 will cover most real money casino players whilst playability fairs slightly better than ok. Symbols are very important, they look nice if playing slots for free but add weight to any pay table if playing for real money. No surprise then that Leprechaun Hills Slot Pay Table is Irish-themed top heavy. 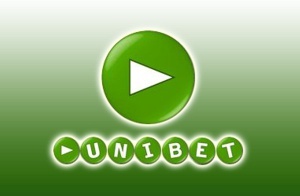 It’s a 40p slot that pushes to £80 a spin with some good returns on high value symbols. These include Leprechauns, fungi, Guinness, horseshoes, 4-leaf clovers and the Leprechaun Hills Wild Symbol. You could check the pay table depending on your betting stake, but these pay handsomely. Lower down the payout food chain, and adding support to the slots 96.49% RTP (payout rate). We have card value symbols (A, K, Q, J and 10). They might look nice, but they pay pittance. I suspect that these symbols will find themselves on most of the 40 pay lines on offer. If you choose to play Leprechaun Hills for real money, then this section will mean more to you. So if you’re going to win money, how does that happen? What luck of the Irish has Quickspin mathematically given Leprechaun Hills in terms of bonus features? Two is the quick answer. If you play 40p slots, and that’s typically high value for the lowest bet. You cover lots of pay lines (40 in this case) at a fixed rate. So when I play Leprechaun Hills on mobile or desktop, I’m looking at how Quickspin fill the void. They do it using a Wild Symbol (We all know what that does), a free spins bonus and a rather gratifying lucky re-spins feature (my personal preference). These are the best likely scenarios of winning money playing with our Leprechaun friend. I won’t lie, betting on 40p slots can be costly. That’s before you’ve even upped the stakes. So it’s nice to see the Leprechaun Hills online slot is equipped with the standard Wild. Most slots players (and I’m one) turn a blind eye to the Wild. It’s not a feature we say, and it isn’t. But Wild symbols can be worth their weight in gold, especially on slots with 40 pay lines. 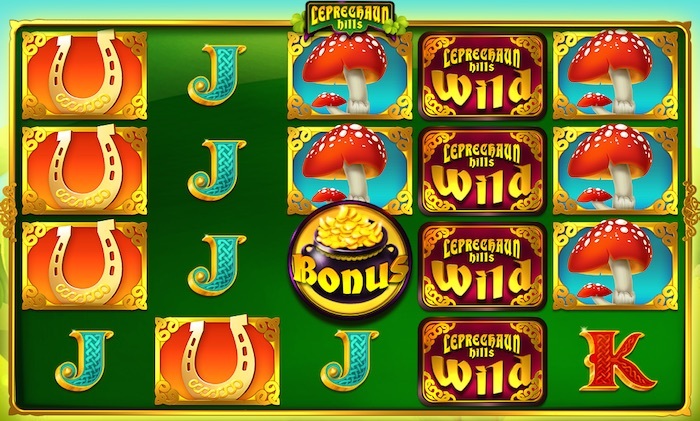 The Leprechaun Hills Wild is the slots logo and will substitute other symbols (not the pot of gold bonus symbol) to help grant you winning combos. Trust me, it’s a nice extra. I mentioned earlier in this review about the Lucky Re-Spins feature, Quickspin didn’t need to put it there. So that’s a plus point from us. What is it and how does it work? It’s basically another chance at winning from a winning combination. Remember, it’s a 40p slot game so we’ll take anything on that 40 pay line draw. The Lucky Re-Spins Bonus uses medium value symbols (horseshoe, four leaf clover, leprechaun, fungi and Guinness) wins and stacks them with the winning symbol for a re-spin. A Leprechaun slot and Irish-themed slot with this addition adds weight to every spin. The scatter symbol (everybody’s friend) when it comes to playing slots for real money is the pot of gold. Hey, shouldn’t that be at the end of the rainbow? With just 7 free spins this isn’t your most fruitful free games bonus. You’ll need to get 3 pots of gold symbols on reels 2, 3 and 4 respectively to kick this feature into gear. Not so good, just 7 free spins, what is good, a rainbow symbol. If you find the rainbow (mystery symbol) during your free games, it turns into a medium value symbol (50% of the time). It means you’ll win more, so maybe that pot of gold is at the end of the rainbow after all. If you don’t mind playing slots for 40p (cheapest spin) you could do well from those 40 pay line returns. You can play Quickspin Leprechaun Hills for real money from 40p to £80 a spin and lots more betting stakes in between. The jackpot is 1000 coins which is decent but the 96.49% payout rate dips below the RTP’s we’ve seen on some other slots in 2017. Saved by its Lucky Re-Spin odds, Leprechaun Hills can pay out considerably on single spin wins, even topping the jackpot. If you’re a fan of Leprechaun slots and Irish-themed slots, then Quickspin has you already. Yes, it’s a genre that’s overcrowded, but there is always room at the inn for slots with added Irish luck. But I find that playing slots for 40p can be expensive, the music all so jolly when those 40p spins are mounting up, the grinning leprechaun when you’re losing money. Yet, then I remind myself I’m covering 40 pay lines (it costs), it’s quite fun to play (it is) and there’s a lucky re-spin potentially built in to every spin. At Slotsquad, I think we like Leprechaun Hills and what Quickspin has added to this niche.